"CAST A SPELL, MIX A POTION, TRY A TRICK! Psychic Eye Book Shop manager cheers "the Harry Potter craze": "It's taken away a lot of the fear. People are more accepting of things like witchcraft and magic after Harry Potter came out. We find that we are a supporting environment for customers like that." Mountain View Voice, CA, 7-26-02. Harry Potter and the Sorcerer's Stone opened on November 16 at a record-breaking number of theaters across the country. "Christian" as well as public schools bussed their students to see the long awaited movie based on the first book in J. K. Rowling's ground-breaking series. Teachers are facilitating classroom discussions that train students to seek "common ground" and conform to an ever-changing group consensus. While forbidding prayer in the name of Jesus, most schools seem to welcome spells and sorcery in the name of Harry Potter. The pressure to participate in the fun and frenzy is intense. So what can a Christian child do in the midst of such hype, hypocrisy and popular wizardry? Those who know God can find answers in His Word. Consider this list of Biblical warnings and wisdom, then put on the Armor of God and pray that He lead you in His way. 2. The movie's foundation in fantasy, not reality, doesn't diminish its power to change beliefs and values. Imaginary (or virtual) experiences and well-written fantasies can affect the mind and memories as much, if not more, than actual experiences. Designed to stir feelings and produce strong emotional responses, a well-planned myth with likeable characters can be far more memorable than the less exciting daily reality -- especially when reinforced through books, toys and games as well as movies. Small wonder Harry's fans have been counting the days until their next fantastic journey into Hogwarts' classes on sorcery, divination, potions and spells. 3. Each occult image and suggestion prompts the audience to feel more at home in this setting. Children identify with their favorite characters and learn to see wizards and witches from a popular peer perspective rather than from God's perspective. Those who sense that the occult world is evil face a choice: Resist peer pressure or rationalize their imagined participation in Harry's supernatural adventures. If you could cast a spell on someone, what would it be? Daniel: "If I liked them, it would be a spell where I'd give them special power, like invisibility. Your favorite word in the Harry Potter books? Daniel: "I like the word--it's very bad to say this--but I like the word Voldemort." What magical power would you like to have? Rupert: "I'd like to levitate." Do you prefer to play a bad or good character? Tom: "Bad. It's more fun because it is different. Tom: "Invisibility. So I could sneak around and go places I shouldn't." Did you find it hard torturing Harry? Harry M: "No. I found it quite fun, actually." Harry Potter Special: Inside the Magical Magazine (Primedia, Inc.), pages 24, 26. David Rockefeller ( "search" for "Rockefeller" on this site), Vice-President, Financial Operations. 4. God tells us to "abhor what is evil" and "cling to what is good." (Romans 12:9) But when Christian children and teens love the Harry Potter myths, delight in the movie and read the books again and again, they are desensitizing their hearts and minds to its evil. Turning God's truth upside down, they are learning to "love" what is evil. The natural next step is to reject God's wise boundaries and "abhor" what He calls good. 5. Immersed in Hogwarts' beliefs and values, children learn to ignore or reinterpret God's truth. They lose their natural aversion for the devious spirits represented by the creatures and symbols in this eerie world. Caught up in the exciting story, they absorb the suggested values and store the fascinating images in their minds -- making the forbidden world of the occult seem more normal than the Kingdom of God. 6. This inner change is usually unconscious, for the occult lessons and impressions tend to bypass rational scrutiny. After all, who will stop, think and weigh the evidence when caught up in such a fast-moving visual adventure? Fun fantasies and strategic entertainment has a special way of altering values, compromising beliefs and changing behavior in adults as well as in children. This learning process has been named "edutainment" -- a favored way to train multicultural citizens for the envisioned 21st century community. Its power to influence beliefs and behavior is illustrated by today's marketing firms which spend billions on entertaining ads that touch emotions, ignore the facts, yet motivate people to buy the product. The mainstream media uses the word "muggles" to deride those who don't want children to read Harry Potter books. "A columnist from the Chicago Daily Herald used Harry-Speak.... He said that a particular NBC Olympics commentator was the 'dementor of the sports commentators.'" "Coeur d'Alene, Idaho is going to name this year's snowstorms after the Harry Potter characters. The first blizzard of the year will be called Albus...."
8. The implied source of power behind Harry's magical feats tend to distort a child's understanding of God. In the movie as in the books, words traditionally used to refer to occult practices become so familiar that children begin to apply the same terms to God and His promised strength. Many learn to see God as a power source that can be manipulated with the right kind of prayers and rituals -- and view his miracles as just another form of magic. They base their understanding of God on their own feelings and wants, not on His revelation of Himself. 9. Blind to the true nature of God, children will blend (synthesize) Biblical truth with pagan beliefs and magical practices. In the end, you distort and destroy any remnant of true Christian faith. For our God cannot be molded to match pagan gods. 10. God tells us to "train up a child in the way He should go." It starts with teaching them God's truths and training them all day long to see reality from His, not the world's perspective. To succeed, we need to shield them from contrary values until they know His Word and have memorized enough Scriptures to be able to recognize and resist deception. Once they have learned to love what God loves and see from His perspective, they will demonstrate their wisdom by choosing to say "no" to Harry Potter. 11. While some argue that Harry and his friends model friendship and integrity, they actually model how to lie and steal and get away with it. Their examples only add to the cultural relativism embraced by most children today who are honest when it doesn't cost anything, but who lie and cheat when it serves their purpose. 12. God has a better way. When His children choose to follow His ways, He gives them a heart to love Him, spiritual eyes that can understand and delight in His Word, a sense of His presence and a confidence in His constant care -- no matter what happens around us. Harry Potter's deceptive thrills are worse than worthless when compared to the wonderful riches our Shepherd promises those who will ignore evil and walk with Him. "Be anxious for nothing, but in everything by prayer and supplication, with thanksgiving, let your requests be made known to God; and the peace of God, which surpasses all understanding, will guard your hearts and minds through Christ Jesus. 3. Harry Potter and Dungeons & Dragons: Like Peas in a Pod? 4. 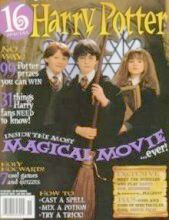 Harry Potter Special: Inside the Magical Magazine (Primedia, Inc., no date), pages 49-53. David Rockefeller ( if you do a "search" for "Rockefeller" on this website you would see the Rockefeller influence on education and global transformation), Vice-President, Financial Operations.